Thankfully the weather where we live is FINALLY starting to improve, the dogs can go for longer walks and I can start planting flowers. Except for a random three days it was pretty miserable, but those three days got all my neighbours out and going DIY crazy!! My new neighbour created a whole garden, complete with paving stone lined paths and wooden boxes she built to hide things she didn’t like the look of. She wasn’t going to let some heavy rain stop her, so she put up a gazebo in order to keep working. Others have been building decks, fencing, planters and so much more. Watching all this constructing going on has in no way inspired me to learn how to do it (I’m happy to remain an observer), however it did inspire me to write this article. I’ve written about them before in the mobility section of my website, because along with the pet stroller they are a marvellous invention. 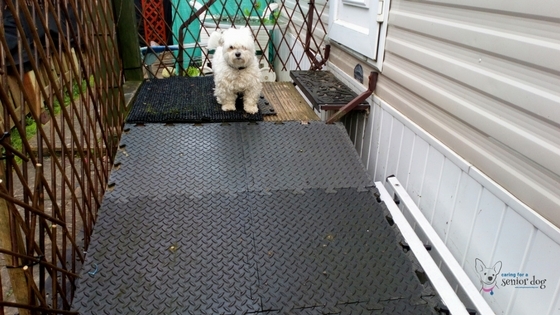 Whether your dog is too big to lift, or you have mobility issues that make even picking up the tiniest dog difficult, a ramp is a wonderful thing. They are available in lots of different sizes, and can be put alongside a bed and used for getting in and out of cars, suv’s trucks and vans. With so much selection you’re probably wondering why I’m even talking about building your own. After all, you can get a reasonably priced one delivered straight to your front door! The first time I used a ramp was when a neighbour gave me a wooden one she no longer needed. It folded, which made storing and transporting very convenient, and was carpeted so the dogs were steady. I used it next to the bed because that’s where our dogs sleep, and they can’t jump up on their own. The second time was out of necessity. We had adopted a puppy mill rescue who, literally, had no idea how to use stairs – she would fall up them or fall down them. 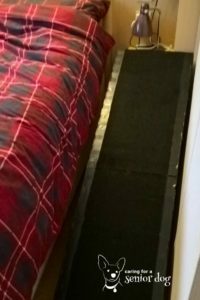 I knew the best thing for Saffy would be a homemade ramp so I started “mentioning” it to my husband. When she hurt her leg (don’t worry she was fine!) he finally started building, and even though Saffy is no longer with us, poor baby, we still use the ramp and it’s perfect. If you’re handy or are keen to learn, it could be a really fun project to start. If you want it built but are unable to do it yourself, for whatever reason, hire someone to do it for you. If you’re going to hire someone, I speak from experience when I recommend you do a lot of shopping around…unless of course you know someone who could easily knock one up for you. When I first started looking I called companies that specialised in ramps, but boy were they crazy expensive! Local builders also wanted a fortune because they wouldn’t build anything less than a super duper jaw dropping ramp. Hey I get it, pride in craftsmanship and all that, but all I needed was a simple ramp! It didn’t have to hold 300lbs of weight and last a century!! Before you head out to your local home improvement store, you’re going to need some questions answered first. Getting on and off the couch? In and out of bed? A car? Replacing steps to your front door? How long and wide does it need to be? Don’t forget to factor the degree of the incline into your calculations. Ours is made of wood, with rubber non stick squares nailed on top. Is there another material you’re thinking about? Does it need to fold for storage? Raised sides to prevent your dog from falling sideways off the ramp? How high would you like the sides? Do you have the necessary tools or do you have to borrow or buy? How much would they cost? You’ve answered all the above questions, and you’re ready to go ahead with this “build your own ramp” project. Do you create your own plans? Wing it? Follow instructions/watch a video? My husband decided what he wanted to do, had a plan in mind that he knew not to bother sharing with me, and just got on with it. Not a written plan in sight! If that’s the direction you want to take, have fun I’m sure it will be gratifying to create something from a vision in your head. If you need, or prefer something a bit more structured, here are some detailed plans you’ll want to have a look through. You may find “the” perfect ramp in the bunch, or you can mix and match to create the one that best suits your needs. I found Pinterest to be the best source of plans, so here a few links I hope you will find helpful. I would love to see your finished product, so by all means send in a picture and I’ll be happy to post it. Some of them are surprisingly easy. I watched a neighbour of mine put one together in no time! I don’t own a dog, however a ramp for senior dogs makes perfect sense. I had no idea they had companies that deliver them too. I guess I just never thought about it. Knowing myself, I’d probably try to build one myself to save money and customize it the way I want just as you mentioned. I’m a fan of DIY projects. If you love DIY I’m sure you’d do a great job. 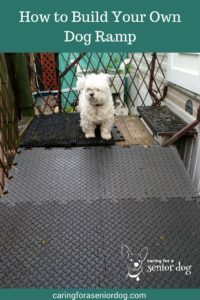 I never thought of a dog ramp until my puppy mill rescue Saffy came into my life, and had no idea how to go up or down stairs. Last fall Theo started having a lot of pain and wasn’t able to go upstairs or jump. I was looking into building a ramp for him, but luckily the laser therapy gave him relief. I know dog ramps are probably in our future, so I’ll be saving this! 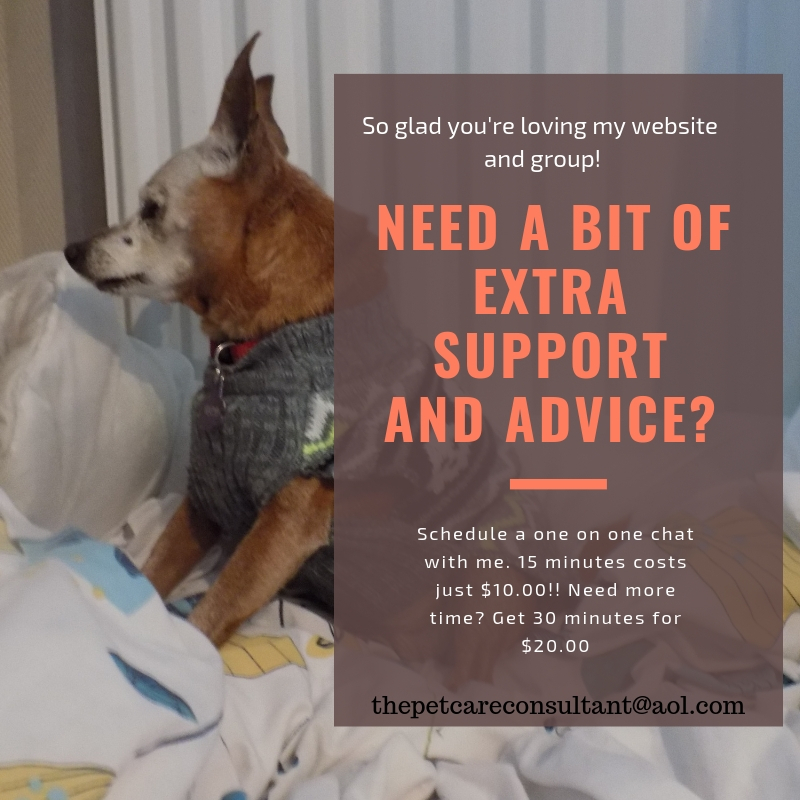 I’m glad the therapy helped, my vet started advertising laser therapy quite some time ago which I find encouraging as an alternative to strictly recommending drugs. Ramps are a wonderful aid, and the one my husband built is perfect for that awkward space. See what I mean!! The prices were outrageous so hubby built one himself. It’s been standing for a few years now, so he did a good job. Not something I would ever attempt, or be interested in attempting but I’m happy to reap the benefits! This is wonderful Hindy! My husband is a huge DIY-er, he’s made so many things for us. I like that you included those important questions to ask yourself first. I pinned this to my Pet DIY board, thanks! Thanks Cathy! My husband is pretty handy, it’s getting him to do anything that’s the problem!! In all fairness he does work so I can’t complain. Thanks for pinning I appreciate it. Thank you for sharing this. Ramps can be a dog’s best friend. They were for Jasmine. We built some ourselves (one going into the yard, and one for our “bus.”). When we needed one for Cookie, the vehicle we now have is too small to fit a ramp that would be long enough. We needed something that would fold. We ended up trying the Solvit telescopic ramp; it’s a great product. They are an amazing invention and I have heard great things about the Solvit telescopic ramp. Glad you found something to help! We have built a ramp for our senior Weimaraner. We are improvising now but would like to know what type of nonslip material you covered yours with. Our ramp is in the sun part of the day so cannot use black. Our deck is high so we had to make the ramp long to make the incline less. The ramp is three feet wide and twelve feet long. Any suggestions?? My husband used non skid rubber mats and nailed them to the ramp. There are lots of things to try including non skid decking strips, anti slip tape… Check online there are lots of options. Hope this helps.